Want to learn how to write business rules? Writing Business Rules should be easy. After all, you’re documenting how the business works, right? This shouldn’t be too hard as you’d assume everyone knows how it works. It’s how they do thing every day. Alas, that’s not always the case. 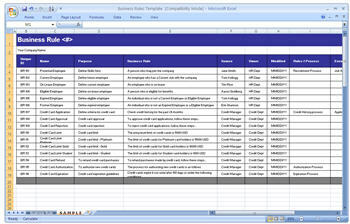 Download these Business Rules Templates (MS Word/Excel) to clarify the appropriate action (i.e. rule) that needs to be taken and remove any ambiguity regarding the correct course of action that must be followed. After finishing a recent technical writing project for a bank, they asked if I could look at their business rules library. While I’d heard of business rules mentioned in vague terms, it was an area I’d no practical experience of documenting. Next day, the business analyst team walked me through their business rules library – think of it as a handbook for all existing business rules and you have the idea – and showed me their templates, examples and guidelines. It was getting clearer, but I still needed more direction. How to define Business Rules? From another angle, business rules work like procedures or Work Instructions. They’re very granular (ie low-level instructions) and define a single task. to apply for a bank loan, the business rules require that you meet five conditions. If you don’t, the application is rejected. Definitions – These are the specific words, phrases, terms and language used to express the rule. Terms are usually captured in a glossary in the appendix section. Facts – These are the starting points for applying the business rule. For example, it’s a fact that a customer can apply for a loan, request a bank statement, or withdraw money. You can define facts as relationships, attributes, and structures. Constraints – What limitations are imposed upon the rule? For example, you need to have 10k in your account to apply for a loan. That’s a constraint placed upon the customer. Derivations – Business rules define how knowledge may be changed into other knowledge, possibly in different forms. As I mentioned above, Business Rules are not dissimilar to standard operating procedures. With this in mind, you can use numbering and naming conventions that mirror that way you’d control SOPs. BR101 Bank managers shall approve bank loans over 50k only. BR102 Bank manager assistants shall approve bank loans under 50k, providing the customer has completed documents 1, 2, and 3 successfully. BR103 Customers must apply in writing for all credit card applications. One thing I learned was that while some rules were a single line, others were more complex. Name – Give each business rule a unique identifier. Make it meaningful to the reader. Description – Describe the purpose of the business rule. Use active verbs, remove ambiguous text and strive for clarity. Use flowcharts or UML diagrams to describe complex rules. Example – If possible, include an example of the rule. Source – Identify the source of the rule so it can be verified. This may be a person, stakeholder or team. Related Rules – Identify related business rules, if any, to support traceability. Revision History – Identify when, who and where changes were made to the document. While I am no business rules expert, I can see that there is a problem here. The term “business rule” means different things to different people. To a business analyst, it can mean a business level requirement that may, or may not, be represented in a taxonomy. But, to a Database Administrator, it could mean a requirement in the database, which may or may not, be easy to enforce. I’ll try to share more ideas on business rules as I get a deeper understanding of how they work. Like I said, this is a new area for me, so please jump in.